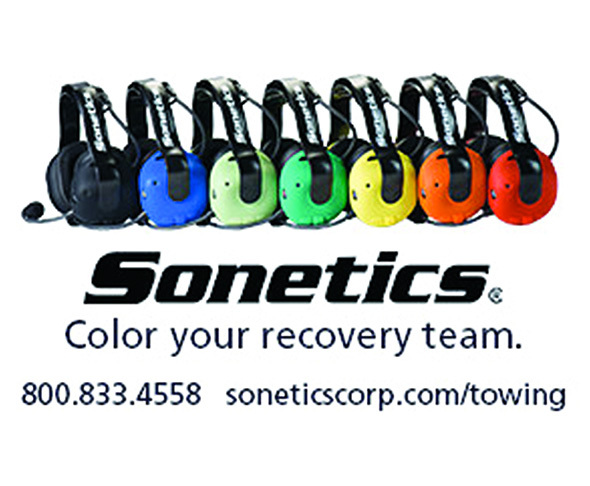 Sonetics portable wireless headsets for safer recovery crew communication. New 24 dB noise reduction rating for improved hearing protection. Robust DECT7 wireless technology, stereo listen-through situational awareness, optional Bluetooth, in-vehicle 12V charging, field-replaceable batteries and colorful silicone ruggedizers for team and position IDs. For more info, call 800-833-4558, email sales@soneticscorp.com or visit www.soneticscorp.com/towing.